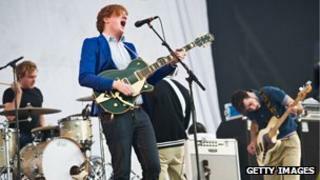 Northern Ireland's Two Door Cinema Club have built up a large fanbase almost unnoticed. Although their singles have all missed the top 40, their debut album, Tourist History, slowly garnered enough sales to earn a gold disc last February, exactly a year after it was released. Their fans include Danny Boyle, who hand-picked singer Alex Trimble to perform at the Olympics opening ceremony while the torch entered the stadium. After three years on the road, the band spent the first half of 2012 in the studio, putting together their second album, Beacon. Due for release in September, it is the soundtrack to their breakthrough, with the trio charting the discoveries and dislocation they felt as they travelled the world; while retaining the sunny, electronic indie sound that made their name. Alex Trimble spoke to the BBC about writing the album, his sleeping habits, and singing to a TV audience of millions at the Olympics. What was it like to play in the Olympic Stadium? I still don't know! It was so huge that I couldn't really understand or process the size of it or the significance of it. I remember the atmosphere. I remember how amazing it felt. But it's still a moment I don't understand. The musical choices were very unexpected. Yeah, there were a lot of independent artists. It was amazing that Danny wanted that aspect of British music to be honoured, rather than the huge stars. Well, the first record kept on going and going and going. The touring felt like it was never going to stop. And of course we were enjoying every second of it, but it came to a point where we thought: 'Right, let's take a break, let's move on to the next thing'. We'd been collecting ideas while we were travelling, and I keep little notebooks about everything that's going on. So when we finally stopped at the end of September, we had two or three months solid to put our ideas together. So it got to December. A lot of the songs weren't actually finished, but we decided we wanted to book a studio, find a producer, get the ball rolling. And you hired Jacknife Lee (U2, REM). What was his contribution? He focussed us in the most unique way possible - by distracting us. We would be recording something and he'd stop us to watch a video on YouTube. Something totally unrelated. It was just chatting, watching videos, listening to music, and then he'd go: 'Ok, let's do this. You get a guitar, let's plug something in, let's record'. He was a fantastic facilitator. He knew exactly how to achieve what was in our heads. From the start, those were always going to be the opening and closing lines. We're always away, always travelling, always moving on to the next thing. You're always looking forward to what's coming next, because it's such a thrilling life to lead, but at the same time there are downsides. What's the thing you miss the most? It constantly changes. Sometimes I just miss my own bed but at other times I really don't - I love sleeping on the tour bus and when I get home I can't sleep, because it doesn't feel right. But the constants are the people. Family and friends. I always miss "proper" chips when I'm away. Yes, that's a good one! Sometimes you get a craving - "I'd just love a fish and chip supper" - but you're in Azerbaijan! A lot of the songs on the album talk about sleep - even the titles reference it: Sleep Alone, Settle, Wake Up. Is lack of sleep a peril of touring? Oh, yes. Some places we'll be on stage at two in the morning, and in others we might be on at midday. There's no consistency in our life. There's no regime, there's no routine. If you combine that with travelling, you never know what time it is. Time is constantly changing around you. Were you conscious that sleep deprivation was becoming a theme of the album? It wasn't something I thought about while I was writing. It was actually kind of a nice surprise when I listened to the songs together and I realised that there were continuing themes. A lot of people are going to read this and think: "Oh no, not another rock star moaning about life on the road". It's not like that at all. Although there are some more sombre tracks, lyrically it's quite positive. If there is a more melancholic song, we want to have nice grooves and melodies to combat that. I'm not trying to upset people. In an old interview you said: "Our ambition is to be our own favourite band." Have you achieved that yet? We are closer. We are definitely closer. Who have you still got left to beat? The Beatles are my favourite band of all time, and I don't expect to ever be a better songwriter than Lennon or McCartney. I just want to keep on being the best I can. We write songs that make us happy, that we would want to listen to. It's been a pretty difficult year for guitar bands. Do you notice it around you? You do. You definitely do. But we're not trying to "bring guitar music back". We're not part of a scene or movement. We just love guitar music and dance music and all other kinds of music - so we combine everything we love, regardless of whether it's trending, or popular at the minute. You unveiled the artwork for the album and the first single, Sleep Alone, last week. The general theme seems to be "legs and pants". I suppose there is a bit of a sexual element to the covers... We were working with a French collective called Megaforce, who did out first album cover. We played them the record, and I mentioned Guy Bordin, who did a lot of the 60s and 70s European Vogue covers, and Sam Haskins and Helmut Newton. That was all the direction we gave them, and the first idea they came back with was perfect. So clear and so mysterious. I think it fits the record perfectly. Beacon is released on 3 September 2012 by Kitsune.